NOTE: Given the sad realities and dire straits of fellow Filipinos in the homeland, it is a rare occasion that we see a few individuals who may give us hope that the lights are not completely out. Anyway, Here's an article by one of these few --obviously non-communist-- who speaks out; a relatively, young ex-military (PMA/West Point Class 1986) officer. UPDATE: I found this news shockingly sad and an enormous loss to the homeland: minutes after posting this one, a relative emailed to say that former Captain Rene N. Jarque had a cardiac arrest last August 19 in Jakarta (he was to turn 41 in October). We seem to have only a "few good men" and for some reason, the homeland loses them. We wonder why them? Sixteen years after, that question is still very much relevant. Today, there is tremendous disenchantment with government and the public is in a restive mood. The economy is hobbling along burdened by poverty, foreign debt, high fuel prices, inflation, unemployment, budget deficit and uncontrolled population growth. Peace and order is unsteady with insurgency, terrorism and criminality. Corruption scandals plague the presidency and the military. Her Excellency is being accused of cheating in the last election and her spin doctors are taking the people for a ride in a circus of lies and deception. Our country today is being bamboozled by a discredited, crippled and insecure government which does not seem to have a clue, cannot get its act together and lacks the strength of character to lead the nation out of its misery. There is a crisis in national leadership and the people are confused and demoralized. However, by declaring in Article II, Section 1 that “sovereignty resides in the people,“ the Constitution silently condones rebellion as a means to change government. As this democratic right was aptly described by former United States President Abraham Lincoln, “This country, with its institutions, belong to the people who inhabit it. 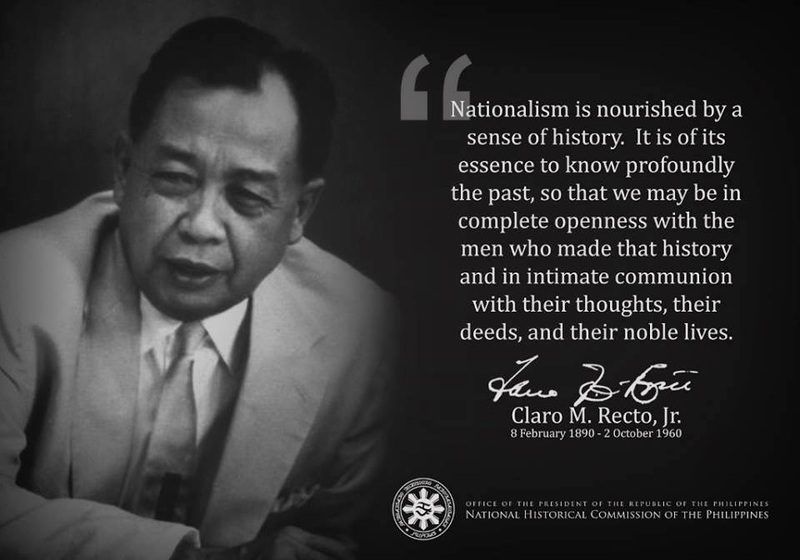 Whenever they grow weary of the existing government, they can exercise their constitutional right of amending it or their revolutionary right to dismember it.” Marcelo H. Del Pilar also said something to the same effect: “Insurrection is the last remedy, especially when the people have acquired the belief that peaceful means to secure remedies for evils prove futile”. I have a simple interpretation of these seemingly contradicting provisions: “The armed forces shall follow the elected government for as long as the people are fine with it but once the people revolt, the armed forces, being of the people, should go along with them.” Indeed, what if the government turns out that it cheated in the elections? What if the supposedly legitimate government no longer reflects the commonweal, is going against its own people and uses the so-called majesty of the law to hide its corruption and flaunt its powers? If the armed forces continues to protect such government, can we can say that the armed forces is no longer acting as the guardian of the people? What if the armed forces no longer finds “nobility, dignity and honor” in being the guardian? Our experience in 2001 shows that the Constitution can be conveniently discarded to suit the situation. In other words, the majesty of the law can be ignored to cater to those in power or seeking power without the people’s mandate. In the end, the only justification for rebellion or the extra-constitutional takeover of government is victory. If one fails, he is charged with rebellion and sent to jail. From a constitutional point of view, the AFP leadership in EDSA Dos (i.e., people’s uprising in 2001) was clearly unprofessional. They mutinied against their commander-in-chief who represented a great majority of the Filipino people and they gravely undermined the Constitution. Consciously or unconsciously, the generals preserved the military’s power using a loud and powerful minority as cover against the silent and weak majority. Since there has been no real change in governance and only change in personalities, the action of the AFP leadership in 2001 was misguided and self-serving. They were desperados who merely enabled the trade of one set of crooks and nincompoops for another. For the situation today, I believe the armed forces should play the constructive role. It is a balanced role wherein it does not stand idle or directly take over government. It is neither indifferent nor destructive. In this role, the armed forces acts within the framework of the Constitution and as a counterweight to an ineffective government of unruly and corrupt politicians to achieve political stability. Further, it acts as catalyst for improving governance and a force for nation-building. If war is too complex to be left to the generals, governance is even more complex to be left alone to the politicians, especially the irresponsible and corrupt. Our soldiers are actually very experienced in this constructive role. The military strategy against insurgency calls for winning the hearts and minds of the people in the countryside. In doing so, the soldiers become involved in the political, economic and social life of the community. When I was the commander of a remote detachment in San Mariano, Isabela, a major part of our counter-insurgency effort was community projects. My soldiers and I were involved in backyard beautification and cleanliness, medical civic action and building toilets and classrooms. I advised the barangay leaders on how to manage the village. Before my unit was transferred, we were talking about cooperatives, markets and farm-to-market roads. Through this exposure to the community and seeing the failure of government, our soldiers undergo a subtle process of politicization that has made them sensitive to the political life of the nation. The participation of junior officers in the coup attempts and in the mutiny at Oakwood in 2004 is largely because of this politicized view. In relation to the corruption case filed against Maj. Gen. Carlos Garcia, the Chief of Staff can order the AFP finance office to open all documentary evidence. For the jueteng (an illegal numbers game) scandal, military intelligence is more than capable of gathering evidence to confirm the claims of the witnesses in the Senate hearing. As to Gloriagate (allegedly wiretapped conversations between the President and an Election Commissioner), the AFP has the resources to confirm the authenticity of the purported wiretapped conversation. Indeed, if the AFP is convinced that the President has committed improper or illegal acts, it can quietly send her a message to do what is right for the good of the country or lose its support. Two inherent risks of this constructive role are the potential abuse of power and unwarranted intervention. Power tends to feed on itself, if uncontrolled, until it becomes so corrupted that a turn-around is very difficult. The experience during martial law all too clearly showed the ill-effects of an overreaching military which has lost touch with itself and the people. It became greedy, corrupt and abusive. To protect itself and perpetuate its power, the armed forces can needlessly intervene using convenient even contrived excuses. To minimize these risks, the armed forces should seek a balance with the people and must always analyze the overarching implications of its actions to society and act with the common good in mind. But let’s be honest. The armed forces can take over government anytime it chooses and we cannot really do much about it. Sure, there will be condemnation from certain groups and the international community. There will be protests and demonstrations but in the end, if the armed forces persists and it is united, there is not much the people can do against guns and tanks. If it intervenes in a time of political uncertainty, such intervention will most likely be gladly accepted by the people. How long the people can tolerate a military or military-sponsored government will depend on how it is able to govern and fulfills people’s expectations. If unable to do so, there are already existing insurgent organizations throughout the country that can serve as a nucleus for armed rebellion. Military intervention is a mere power-grab if it only results in a change of personalities in government and there is no real structural change in society, particularly in the equitable distribution of political and economic power. If the intent is really to make society better, then the military government or military-sponsored government should focus on 1) establishing a competent and honest government, 2) building the economy, 3) professionalizing the military; and 4) rebuilding democratic institutions. Of the last one, an important task is to prepare the people for an election and then hold an election as soon as possible. “Preparing” would include disciplining wayward and corrupt government officials; setting up democratic institutions such as political parties and peoples organizations; educating the people about their rights and responsibilities as citizens; and fixing the electoral system. A constructive, professional armed forces serves as a buttress to democracy and the Constitution. It serves as the guardian of democratic processes while ensuring that it does not abuse its own power. It uplifts democracy by strengthening the pillars of governance. It will not allow an irresponsible and corrupt government to govern. By being professional, it can pull or catalyze the government and the bureaucracy to become better. Truly, the crucial challenge for the armed forces is how to rebuild itself to a professional and mature organization. The first imperative is professionalizing the Officer Corps which is the foundation of professionalism in the AFP and the driving force for sustained reform. Among the younger members of the corps, there is an inherent desire to change. Professionalization efforts should nurture this desire by opening up channels for constructive criticism and initiating affirmative action. There must be an organized effort mobilizing the Officer Corps to awaken the generals from their collective self-denial that nothing is wrong with the AFP and to push the chain of command to initiate painful but necessary changes, especially the creation of a performance and merit-based system in promotions and assignments which will ensure that only those who are competent and honest go up. Another key target is the non-commissioned officer corps. If the officers are the brain, the corporals and sergeants form the workforce or backbone of the armed forces. Besides people, the armed forces should develop efficient, effective and ethical management systems in personnel, procurement, logistics and finance incorporating best practices and new information technology. Corruption through conversion, construction and commissions should be eradicated. It should formulate doctrine – how it should fight – and not use foreign, especially American, formulations which are alien to us. Instead of alienating the insurgents, the government should reach out and engage them, understand their plight, initiate confidence- and trust-building measures and resolve the matter peacefully. The approach must be holistic as a major factor in insurgency is the absence of government in the remote areas where the rebels are strong. All government agencies should be involved in delivering basic services to the people. However, in my experience, there is this “plan-implementation gap” and government services are non-existent or not felt very much in the countryside. The military alone is not capable and its main task is to contain the violence and make the area peaceful and secure so that government can deliver the services to the people. In Asia, China’s emergence as an economic and military power alongside Japan is changing the regional security landscape. Likewise, old flashpoints still exist – territorial claims, tensions in the Taiwan straits and Korean peninsula. Erstwhile security concerns like maritime piracy, trafficking of drugs and humans and money laundering have become more sophisticated because of global interconnections and new technologies. In this new environment, the armed forces should rethink its strategy and outlook of defense-military alliances. We should perhaps explore closer defense and military links with emerging powers such as China and India and strengthen relations with neighboring countries in Southeast Asia. These alliances will provide the first line of defense and give us breathing space as we rebuild our national defense. We should likewise develop a self-reliant defense posture to design strategies and indigenous military technology so we can defend ourselves using our limited resources and also maintain our national self-respect by not depending too much on other countries for our defense requirements. This twin challenge of rebuilding and dealing with security concerns will take a lot of the AFP’s organizational strength. Change will question age-old perceptions and established norms. It will pit people against one another with regard to ideas, concepts and approaches. There will be tremendous resistance to change. The existing command structure and social order will be disrupted and challenged. However, with the right combination of commitment, organization, leadership and management, the challenge can be met. The armed forces must hold firm, stay united and keep its eyes on the objectives in order to accomplish the mission to change. We pride ourselves as a democratic nation. But our democracy is a sham as politicians manipulate the system to perpetuate themselves in power. How can we even think that we have a democracy when elections, the very soul of democracy, is being perverted by the very public officials who should protect the sanctity of the ballot. Democracy is also not just all about having elections or a Constitution. It is also about having the active and sustained participation of the people through democratic institutions like barangay assemblies, people’s organizations, trade unions and political parties. The armed forces can play a constructive role by safeguarding the elections from fraud and by promoting peoples organizations rather than spying on them. Democracy is also not just the freedom to vote or the freedom of speech or religious freedom. It is also about being able to live with pride and dignity. It is also about economic freedom enabling the practice of these rights. How can one vote if he cannot afford to go to the polling station? How can one practice his religion when he cannot afford to go to church or has to commit sin to feed his family? How can one practice free speech if he cannot even read the newspaper? The government must be able to improve people’s lives so they can exercise their freedoms. The armed forces can play a constructive role in preserving these freedoms by educating the people of their rights and responsibilities as citizens for nation building and engaging in developmental activities to support the national program for economic development.